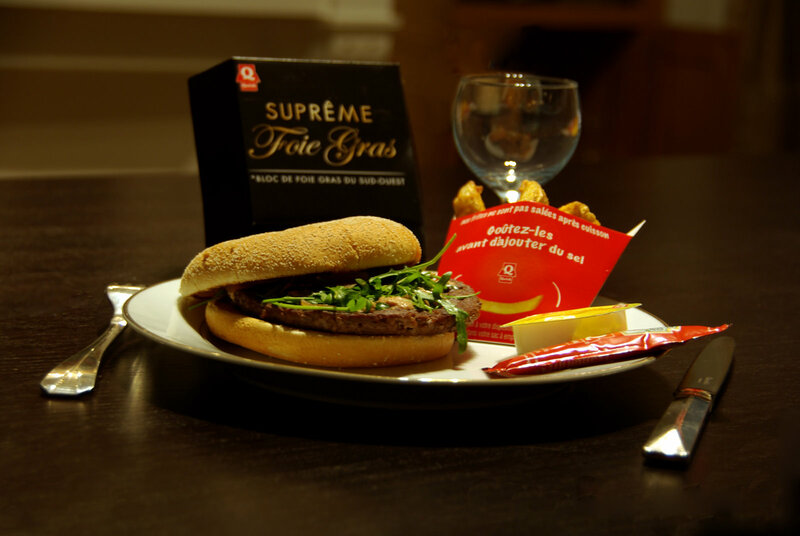 About 2 weeks ago Quick - a French (ex Belgian) hamburger company - announced they were going to sell a foie gras hamburger between Dec 16th and Dec 19th. I happen to have a Quick restaurant in the street where I live, so I could not resist! Of course you don't need to eat it with a fork and a knife in a real plate ;-) BTW, if you're wondering where the foie gras is, enlarge the photo a little bit, you'll see bits of melted foie gras. Is it good? I thing so. But of course I'm biased: I'm French and I love foie gras! I'm not French and I love foie gras. My, that looks yummy... I love Hamburgers and fries. Eric! You're getting into studio work?! This cracks me up!! And what is the correct wine pairing for this -- I see the glass is still empty. But I do hear the violins in the background. Haha! I wish they delivered to Vermont. I do NOT eat fast food, but I can't wait to try a melted foie gras burger. BUT BUT If it is not a pure slab of foie gras (that is, if it is mixed with pork fat and other less pure ingredients) then count me out. Wow. Until today I didn't think anything could top the bratburger (cheeseburger topped with a grilled bratwurst) served at a bar in my college town for artery-clogging burger weirdness. Wisconsin bows down in defeat and passes the crown to Quick. What a beautiful gourmet shot. You made fast-food look classy. I went to the St. Regis Hotel for lunch. I had chestnut soup with duck foie gras tortellini. The soup was delicious. The tortellini was very rich -- I only had a few bites of that. I watched them trim and dress their Christmas tree. It is gigantic -- a very beautiful tree. It took several hours to hang all the decorations on the tree. I met former mayor of San Francisco Willie Brown. He's not as robust as he use to be -- fragile. It was great finally meeting him. Beautiful photo, but is that enough foie gras to taste? But I suppose they had to be skimpy to keep the cost down. Eat well, Eric. Nice! I used to love Quick! I'm Belgian, working in Spain, and I also love the foie gras... We even serve it on surloin steaks! yesterday evening, at my office Xmas dinner, I had foie gras stuffed with (cooked) apples, on slices of gingerbread! Like PHX I never eat fastfood, but this one I would like to try. I'm not French but I love it too though if my brother ( who is a vegan ) knew that I eat it when in Paris I think I might end up as mince meat . My boyfriend wants to try it but I'm quite skeptical especially since I dislike Quick. Plus, I am very difficult with my foie gras, I only eat home made foie gras! ... did I tell you that I also had a Christmas dinner on Thursday night in BNC with my spanish team??? I want what Thib ate! Am proud to say I've never had a fast-food burger in my life, but you've made this look very tasty, Eric (and they use actual arugula, not some soggy, flavorless lettuce leaves). I also like the advice to taste the fries before salting them—never a bad idea. @Carrie "Eric! You're getting into studio work?! " It's because it's so cold outside that I have to find indoor photo topics! @Brattcat "I wish they delivered to Vermont." Er... no chance! @Mrs Vandertramp "...for artery-clogging burger weirdnes..." LOL Actuallt foie gras is... good fat! @Lois "h. I had chestnut soup with duck foie gras tortellini" Yeah I know this must be rich, but it sounds soooo good! @Thib "yesterday evening, at my office Xmas dinner, I had foie gras stuffed with (cooked) apples, on slices of gingerbread!" OK, you win! @Jaq "I might end up as mince meat " ;-) Don't worry we won't tell him! @Cynthia "My boyfriend wants to try it but I'm quite skeptical especially since I dislike Quick" Come one try it... You'll please your boyfriend AND you will taste something really unusual. But hurry, they will only serve it until Dec 19th. @Alexa "Am proud to say I've never had a fast-food burger in my life" So how do you know they usually serve "soggy, flavorless lettuce leaves"???? You know I love you and all things French.......but NOT French hamburgers. You can do some fine frites but you need to step out of the hamburger category and this one...I"m not so sure about either. There is a saying, "You can't polish a turd, but you can roll it in glitter". This is Quick we're talking about, right? I rather like the advice to taste the chips before adding more salt - I wonder if anyone takes any notice? That is creative. Why not! Foie gras really tastes like seasoned butter so in addition to mayonnaise, mustard (moutarde) and catsup, why not foie gras? Really like your photo too!